Under, the spectacular building designed by Snøhetta, is on course for opening its doors in 2019. Now you can secure seats at the table as well – the pre-booking is open. "Food tastes better in fresh air", goes a Norwegian saying. But how about underwater? Soon you&apos;ll get the opportunity to find that out for yourself, when the biggest underwater restaurant in the world, Under, opens in Lindesnes next year. The project has gotten a lot of attention internationally with mentions in both Time and CNN, among others. "The project is a nice mixture of madness and reason. You definitely have to be a bit fearless in order to create something this spectacular," says Gaute Ubostad, initiator and co-owner of Under. Booking opened on 1 February, meaning that you can reserve the unforgettable dining experience under the sea already today. The restaurant will open its doors in March 2019, and the project is well on course: construction started at 15 January. 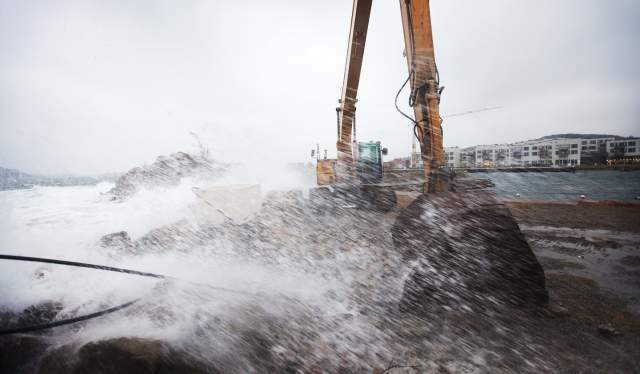 Arne Marthinsen, project manager in SubMar Group, an interdisciplinary group of companies responsible for the wave calculations and the marine operations in the project, explains that the construction will be exposed to enormous natural forces from both the sea, the waves, the weather and the wind. Therefore it was important to design a construction that, instead of challenging the natural forces, can live with them. 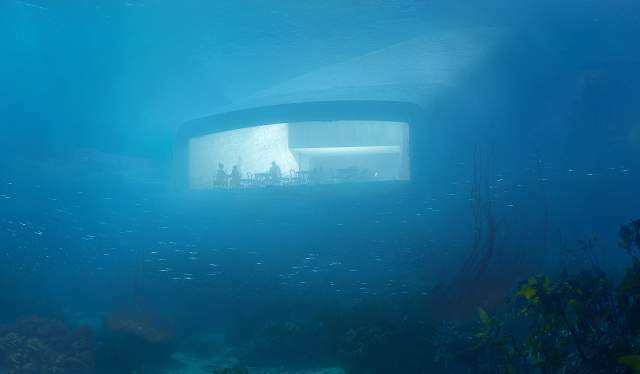 The underwater restaurant is designed by the architectural bureau Snøhetta and will be sloping from the shore down approximately six meters below the surface. The construction will be built on a barge, and when finished, it will be lowered into the sea and attached to foundations on the seabed. Only then the interior work can begin. 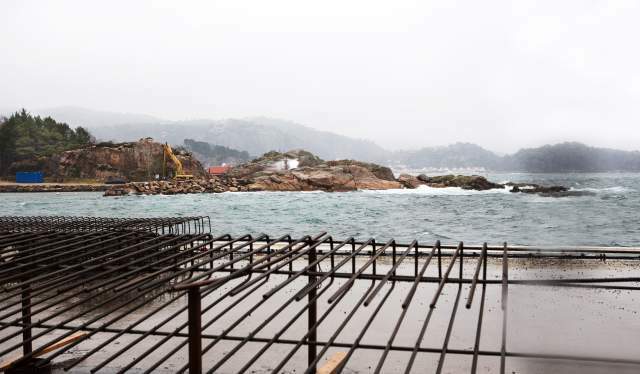 The restaurant "Under" will be built out in the sometimes-harsh waters at Spangereid in Lindesnes municipality, Norway&apos;s southern tip and will be the world&apos;s largest underwater restaurant with seating capacity for 100 guests. When you step into the restaurant, your unique undersea journey begins. Here you can descend all the way to a depth of five metres without a diving suit. Just walk down the stairs. Down in the restaurant, the notion of an "ocean view" takes on a whole new meaning. There, a huge glass wall will give you unique insight into the bustling life in the sea (Skagerrak) outside. You will get to watch all sorts of fish species swim by including huge cod, colourful lip fishes, lobsters in gladiator battles, seals, spiny dogfish (i.e. mini sharks), distinctive seaweed and kelp in the changing seasons. You can also get to see a live performance of the roaring, stormy sea when nature is in turmoil. The restaurant is even going to "cheat" a little to ensure entertainment from the sea for its guests. The researchers will be working to "train" the fish as well as the small animals eaten by the fish. Lighting, sound and smell will be used to attract plankton or cod to the area. And then there will be an ongoing feast to the delight of the viewing audience. "One of our main criteria is that our guests will get to experience something unique in the sea," emphasises Gaute Ubostad. Of course, the restaurant experience is not just about the fish that swim by outside. The fish that is served on your plate is a very important ingredient. The head chef at Under is named Nicolai Ellitsgaard Pedersen, and that means that the food is something to look forward to. Pedersen was formerly the head chef at the acclaimed gourmet restaurant "Måltid" in Kristiansand city centre. Naturally, there will be an excellent selection of seafood at Under. But you also have the option of tasting seabirds and wild sheep that have grazed in the archipelago nearby. 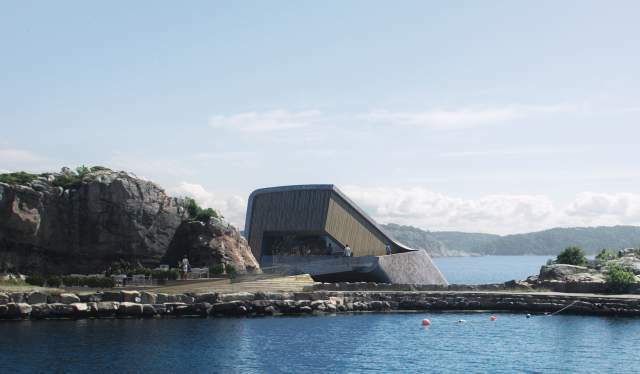 "Under" in Lindesnes will be Europe&apos;s first and the world&apos;s largest underwater restaurant. The restaurant will be opened to the public in 2019. The award-winning architect firm, Snøhetta, designed the spectacular building. Are you ready for a wUNDERful 18-course gourmet marathon – five meters below sea level? Check out the first underwater restaurant in Northern Europe. Visit Southern Norway and experience Norwegian culture, hiking and an amazing coastline with boating and bathing opportunities.